As the rockets red glare on a warm August night in East Tennessee and NASCAR's most popular drivers prepare to get in their chariots for 500 laps around The Last Great Colosseum, there's nothing more special than pre-race at the Bass Pro Shops NRA Night Race. There's something for everyone during pre-race for the upcoming Bass Pro Shops NRA Night Race on Saturday, Aug. 18. From the sounds of the State Water Heaters Pre-Race concert featuring country star Joe Nichols to the booming "This is Bristol" command from world famous ring announcer Michael Buffer and the chorus of cheers and boos during driver introductions, there's energy in the air as day turns to night. "The Bass Pro Shops NRA Night Race is a special experience," said Jerry Caldwell, executive vice president and general manager of Bristol Motor Speedway. "There's a certain buzz as everyone in the stadium gets amped up for 500 laps of intense short track racing. It's the perfect way to celebrate who we are and what we love." Pre-race festivities will kick off with the official State Water Heaters Pre-Race concert featuring country music star Joe Nichols, who is best known for a medley of hits, including "Brokenheartsville" and "Tequila Makes Her Clothes Fall Off". It's the perfect start to an evening of fun and excitement in the mountains of Appalachia. 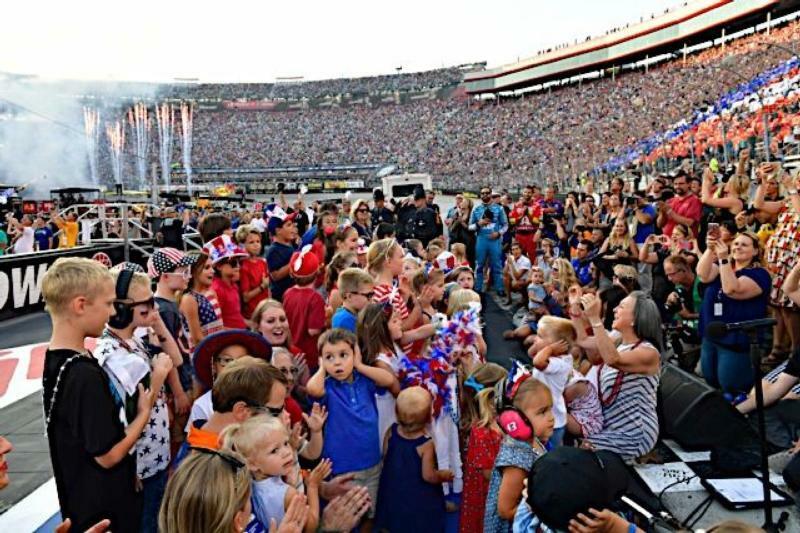 Race fans are always amped up for Bristol's wildly popular driver introductions, which feature the best-of-the-best marching down the ramp into the Colosseum to prepare for battle. With Chase Elliott picking up his first career win recently, will he get the loudest cheers? Bristol Motor Speedway is a place where guests celebrate their heroes, both on-and-off track. The reciting of the Pledge of Allegiance will be led by special guest Lt. Col Oliver North. Recording legend Lee Greenwood returns to East Tennessee for a rendition of his hit "God Bless the USA" while the MRO Children's Choir belts out the National Anthem as fireworks light up the sky and a four T-38 Talons from the 469th Flying Training Squadron at Sheppard Air Force Base in Wichita, Texas fly overhead. Social media sensation Joe Everson returns to BMS, painting American portraits during "God Bless the USA" and the National Anthem. In addition, BMS will welcome three American military heroes, who entered Afghanistan on horseback following the events of 9/11. Master Sgt. Scott Neil, Major Mark Nutsch and Chief Warrant Officer 4 Bob Pennington were members of the 5th Special Forces Group that was dropped into the remote mountains of Afghanistan in October of 2001 to begin the battle against the Taliban. Their heroic mission inspired the best-selling book, "Horse Soldiers" and the big screen hit, "12 Strong". Bristol Police Dept. Sgt. Matt Cousins: Helped stop an active shooter who had opened fire on passing cars near the Days Inn located on Volunteer Parkway in Bristol, Tenn. The electricity truly builds to a roar when the epic "This is Bristol" from Michael Buffer echoes through the stadium. It's a time to soak oneself in the realization that an incredible night is about to begin. The ever popular Street Outlaws team is returning to Bristol Dragway on Tuesday, Aug. 21 for a $200,000 drag race. The characters from the program will be at pre-race, so make sure to cheer them loudly as they tape for the television special that will air in early 2019. Hungry during pre-race? Run out to the concourse and try some of Bristol's specialty food items. Back by popular demand, the Triple Bacon Colossus burger is available at concession stands near Gates 14 and 15 and Gate 7. Check out the Bush's Beans Trackside Café's for some special recipes too. The Pre-Race festivities are only some of the highlights you won't want to miss during the incredible weekend. There's so much to do around the grounds of Bristol Motor Speedway, including taking in the Fan Midway, Fan Zone and Kids Zone. There's music, games, food, souvenir haulers, driver appearances, autograph sessions and more. There's great video entertainment provided by Colossus TV, the world's largest center-hung video screen. You'll also want to kick back and enjoy some NASCAR-style tailgating with your friends prior to each night's race. And speaking of fun, on Thursday, one of the biggest and longest running fan fests on the NASCAR circuit kicks off with Food City Family Race Night. There'll be plenty of appearances by drivers, legends and other celebrities during this event, which takes place in the BMS hospitality area and lasts from noon until 6 p.m.